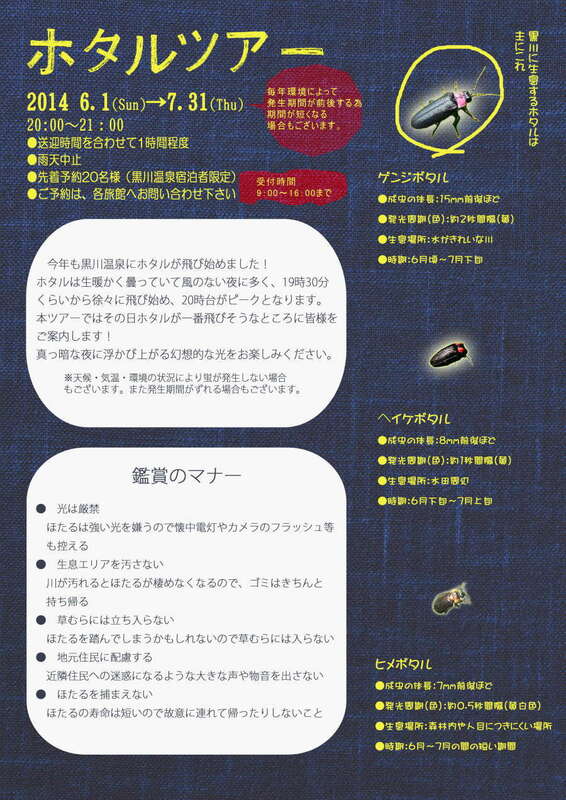 Just a quick mention of the Firefly-watching tour each evening which is is arranged for guests staying at the Ryokan (Japanese Inns) in Kurokawa. The evening tour must be booked during the day (until 4pm) at your inn,and then a bus will pick you up and take you to a nearby viewing area at 8pm for approximately an hour. Twenty places are available on the bus. The tour runs every evening until July 31st,but not in the rain,and sightings are highly likely,but cannot always be guaranteed! Apparently there are three kinds of firelies,the Genji (largest) Heike and Hime (smallest) which all give a slightly different glow or pulse of light! Please DON`T take flash photos,leave rubbish,trample the firefly habitat or make loud noises when you are viewing the fireflies!